In 1919, at a parade honoring returning World War I veterans in Lodi, California, Roy Allen set up a roadside drink stand to offer a new thick and creamy drink, root beer. His creation was such a success, he decided to take on a partner, Frank Wright. 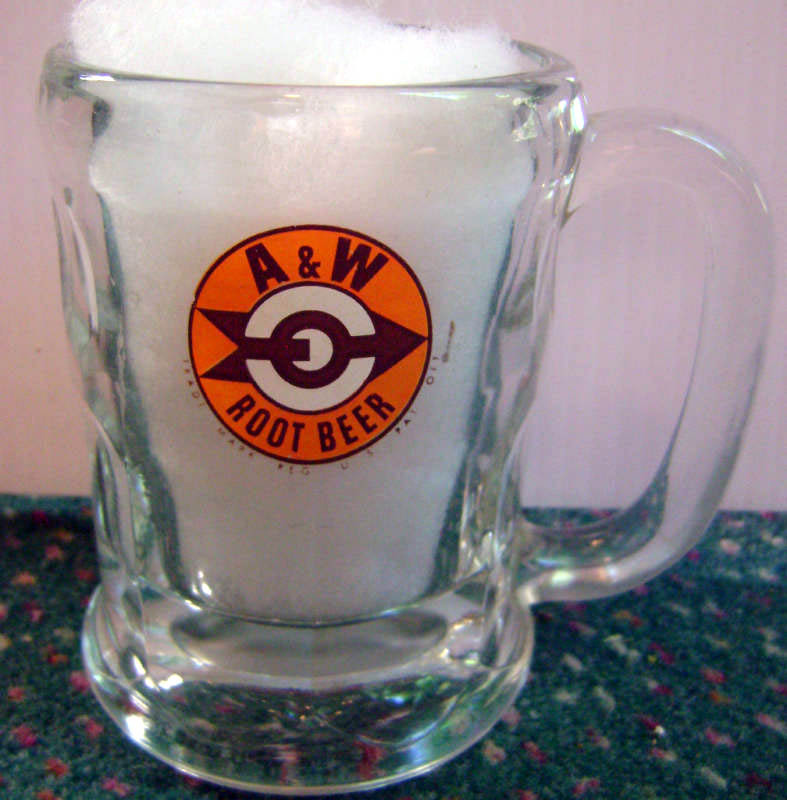 In 1922, Allen and Wright combined their initials to name the beverage A&W Root Beer. Allen wasted no time opening his first permanent root beer stand in Lodi, followed by a second one in Sacramento. It featured the first "drive-in" concept with "tray-boys" for curbside service. Then, in 1924 Allen bought out Wright to pursue a franchising program, which became America's first franchised restaurant chain. 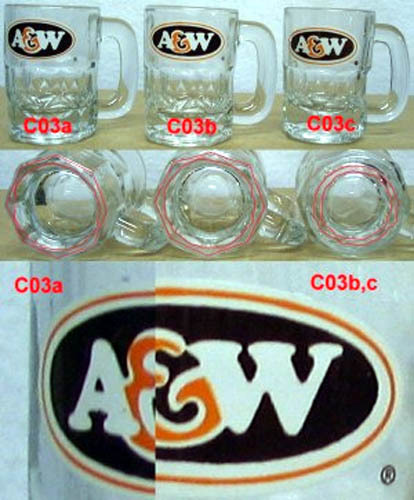 He sold A&W Root Beer concentrate exclusively to these franchises to ensure quality. By 1933, more than 170 outlets were franchised. 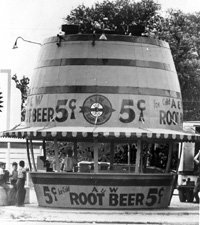 During WW II, A&W Root Beer stands increased in number, despite government sugar rationing. After the war, more than 450 franchises were open, driven by the popularity of the automobile and the new mobile society. In 1950, Roy Allen retired and sold the business to Gene Hurtz. In 1963, Mr. Hurtz sold the A&W Root Beer Company to the J. Hungerford Smith Company. 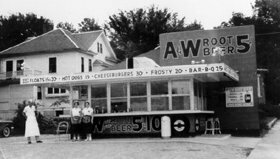 More ownership changes took place during the 60s and 70s, but the only place you could get A&W Root Beer was on tap at an A&W Restaurant. However, Americans wanted to enjoy it at home, too. And in 1971, they were able to do just that. A&W cans and bottles were an instant hit when they were first introduced in Arizona and California. Then, in 1974, A&W Sugar-Free was born. In 1986, A&W Cream Soda and A&W Diet Cream Soda were introduced and distributed nationally. Then in 1987, Sugar-Free A&W was reformulated as Diet A&W. In the March 1995 acquisition of Dr Pepper/Seven-Up Companies, Inc., by Cadbury Schweppes plc, of London, A&W became part of the renamed Dr Pepper/Seven Up, Inc. Today, regular and Diet A&W Root Beer are the number one root beers in all measurable channels. 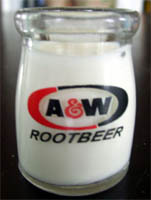 A&W Cream Soda is the top branded cream soda. 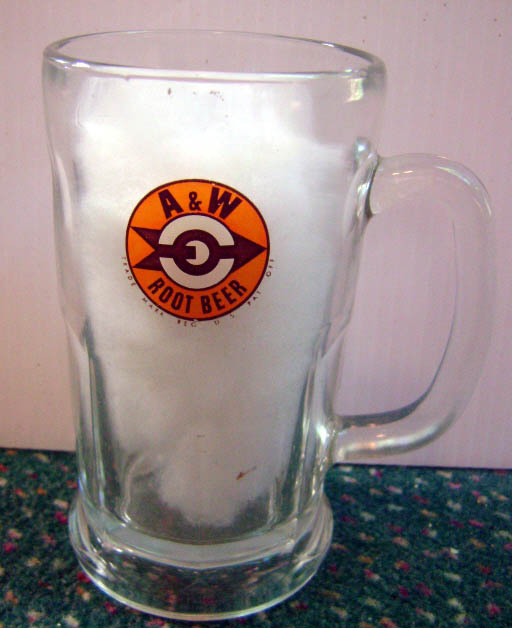 A & W has used thick glass mugs to serve root beer since the beginning of the company. 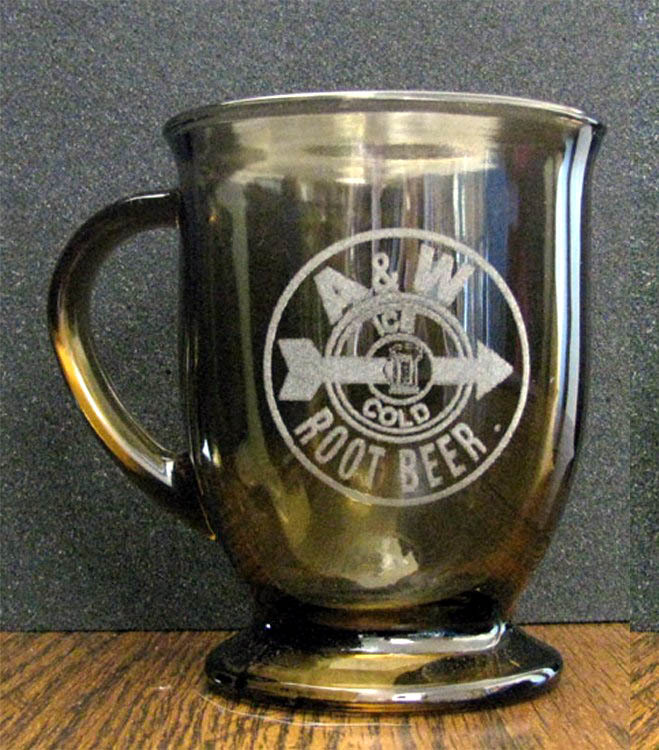 Root beer tastes best when very cold, so A & W franchises were required to use chilled approved glass mugs. 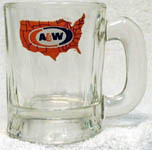 According to our research, three companies have supplied A & W glass mugs in the US, at least up to 1982. 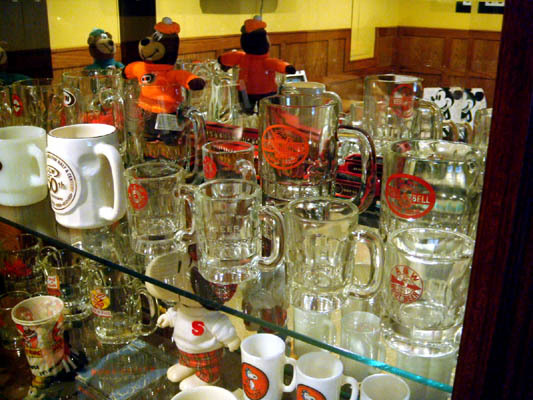 Since the mid-1990s, the Libbey Glass company has supplied mugs in Canada. Hazel Atlas mugs can be identified by the stylized "H" above "A" on the bottom of the mug. Other mugs do not show a mark identifying the manufacturer. Mugs with red outline logos that are not marked "HA" are assumed to be from the U.S. Glass company, as they are not listed in the Kalen document as being Indiana Glass mugs. Mug logos are numbered sequentially in roughly chronological order of first use. 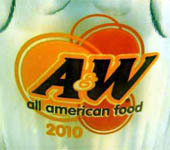 A & W in Canada has used a different logo from A & W in the US since the 1960s appearance of the familiar oval logo. Logos for both countries are included here. Date Unknown - This etched logo is found on a 3.5ounce child's mug and it features a closed O. Date Unknown - We added this logo, but not sure as to its actual date of production. 1921 to 1960 - This mug features raised glass lettering and has a closed '&' and a tall 'E'. Photo of the variations are inside. 1925 to 1960 - This logo features 4 rings with raised burgundy lettering on clear glass. 1925 to 1945 - This is the franchised A & W Root Beer logo for the 5 states out west that Allen allowed to sell his beer until 1945. The names of the owners were H.C. Bell and Lewis Reed....hence the name Reed & Bell Root Beer. 1925 to 1960 - This logo features 4 rings with raised red lettering on clear glass. 1925 to 1960 - This logo features 3 rings with raised burgundy lettering on clear glass. 1940 to 1946 - This 16 ounce mug features a 3 ring logo with raised burgundy lettering on clear glass. 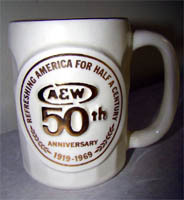 1948 to 1961 - This mug features a logo with black lettering on a red background having 4 circles. 1960 to 1961 - This logo has a red background with clear letters. The only mug having this combination is this small 3.5 ounce childs mug produced in 1960-61. 1961 to 1964 - This mug features a bull's-eye logo with white lettering on a orange background having 4 circles. 1950's ? - Reports are that mugs with clear etchings on them were from the 50's......but we can't confirm the exact dates. 1966 - This logo has a broken white oval with the orange and brown circles shaped like "soup ladles". The term broken means the & sign cuts off the white from entering it. 1969 to 1971 - Removed white from behind the Orange & Brown Oval Logo. 1972 to 1975 - Map of United States is featured on this logo. Mugs in these years came in various sizes with thick and thin handles. Click on image on right to see thick Handle, click on logo on left to see thin handle. 1978 - This is a Large Logo variety mug where the flutes go less than half way up the mug. The other is a small log but exactly the same in detail just smaller. 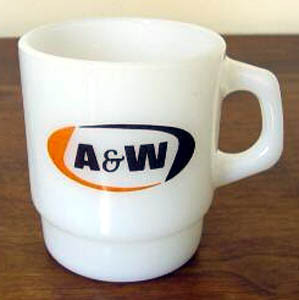 1979 - This mug was produced exclusively for the Franchised A & W Dealer Convention in Hawaii. 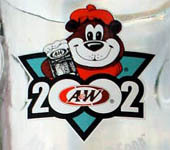 1980's - In place of the Oval Canadian A & W Logo is the face of the Great A & W Root Bear. This mug is presumed to be a special promotional piece from the early 1980's, probably given out to kids in one year only. 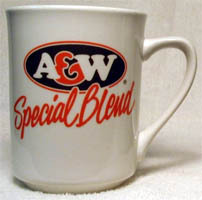 1982 - This 10 ounce mug features a raised A & W logo and is listed in the 1982 Kalen Document as a "sample" mug for nostalgia promotion. The word Root Beer does not appear. 1984 - 1996 This bottle features a single orange ring around the label with the words Root Beer underneath it. 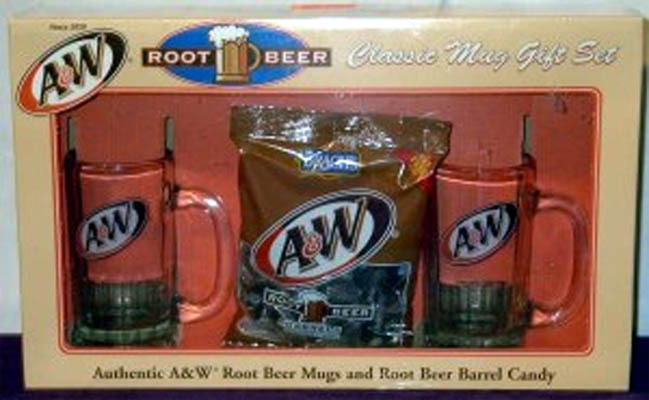 The mugs in these years hold different quantities of root beer, and came with two different base variations. One is flat and one is circular. 1994 - Orange & Brown Oval Logo against a diamond with yellow, teal with the words "75 Years" and "Authentic Since 1919." 1995 - This mug has a slanted logo with shadowed letters. We believe it was sold either direct to the public via mail order or in grocery stores. Click on photo to the right to view. 1995 - 1998 This small 9 ounce mug was made with three different bottoms and a slight size difference in the height of the logo itself. Click on photo to the right to view variations. 1996 - 98 - This mug has the words Since 1956 on the front and the back shows logo and French "Depuis 1956." The logo also has a brown and orange ring. Note: There is another variation of this logo having a single orange ring. 1999 - This mug shows logo and French "SERIE LIMITEE" on the reverse side. Also in this series is Baby, Mama, Teen and Grandpa Burger mugs all being the same size. 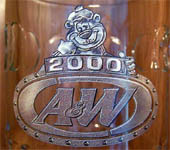 2000 - This mug features a clear glass go and a smiling face of the Great A & W Bear. 2004 - Commemorative 85th Anniversary. 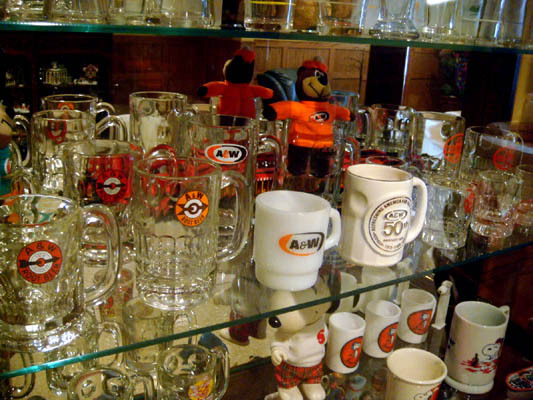 2005 - When A&W distributed its Smiling Bear Rootbeer Mugs, it secretly included 984 Winking Bear Mugs. The differences are subtle, but with the Winking Bear Mug, the bear has one eye closed. 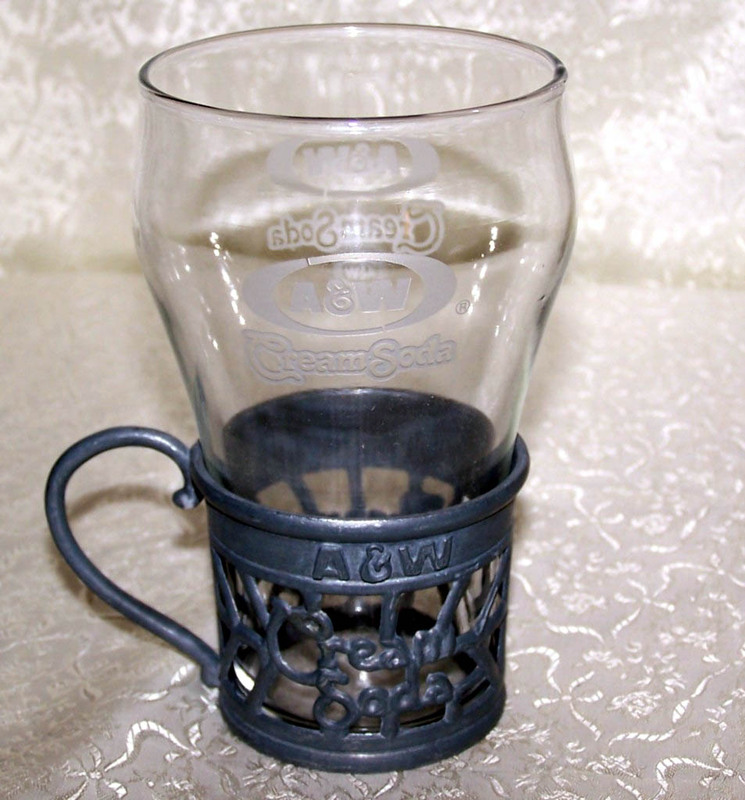 This cup was produced for A & W Restaurants by the Anchor Hocking Company. On the bottom of the cup is says Anchor Hocking, Fire King, Oven-proof made in the USA. 1980's Logo style of Canadian restaurants during the 1980s+. Logo printed on mug, plus green 'Special Blend' under logo. Variety with three diagonal stripes above the left side of the logo. English on one side, French on the other. 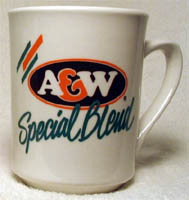 Logo printed on mug, plus orange 'Special Blend' under logo.Variety with three diagonal stripes above the left side of the logo. English on one side, French on the other. 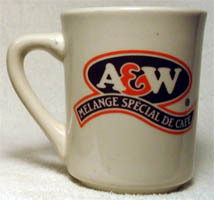 1980's Logo style of Canadian restaurants since mid-1980s. Front has "SPECIAL BLEND COFFEE" under logo. Back has same in French. 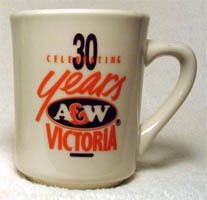 Celebrates 30 years of A & W in Canada, since 1956; special edition for Victoria, BC. Back side has A & W logo with "Special Blend Coffee" in ribbon under logo. This a laser etched cafe cup but its origin, manufacturer and release date is unknown at this time. 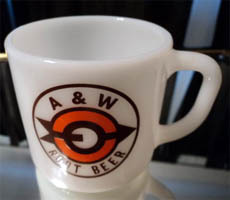 1960's glass A & W Mug - origin and manufacturer are unknown at this time. 1986 A & W Cream Soda glass and holder. Cream Soda was introduced in 1986, but I think this glass and holder were released during the 85th Anniversary, just not sure. 1932 A & W Wax Coated Mega-Phone container. 1968 Small dairy creamer from the late 60's. Note: we are pretty sure this is a reproduction of some kind, not really an original creamer. 1960's This rare ceramic coffee mug has the Fi with a shield on the bottom.